The remainder of our last day in Jixi was spent at Dongsheng (for the ever interesting shift change), on the line between Zhengyang and Xinghua, and finally at Beicheng. The shift change at Dongsheng was quite lively, with lots of workers hard at work with pick axes and shovels working on the track ahead of a couple of SYs – in contrast, Beicheng at the other end of the day was unusually quiet. 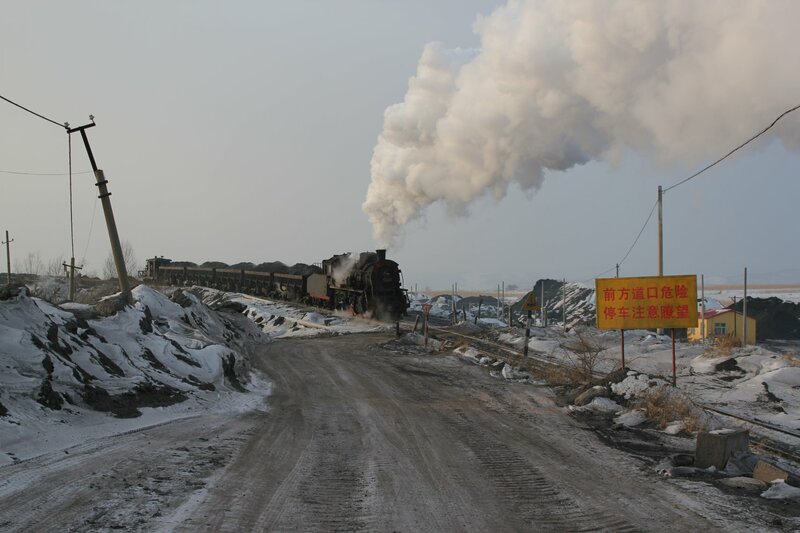 At our chosen lineside spot on the line between Zhengyang and Xinghua we headed out along the track to the 20km post but we were all slightly wrongfooted by the sight of the spoil train heading chimney first from Chengzihe. The main event would be, most unusually, tender first… so off we headed into the fields for a side on shot. It was certainly a test of patience, taking up a few hours! 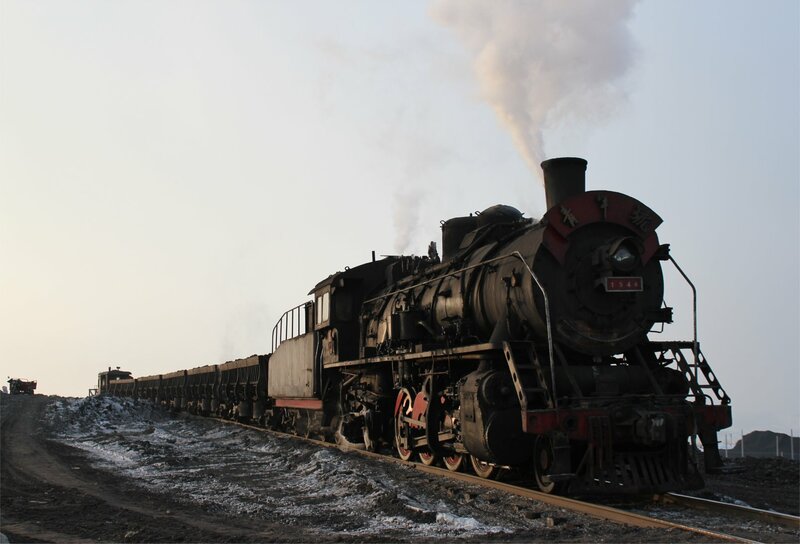 After leaving Jixi behind we took the minibus down to Mudanjiang where we arrived with just five minutes to spare for the night sleeper train (2018) which would take us to Tieling. The day started with a dash down the narrow path to the riverside, across a couple of flow control gates and into the fields. 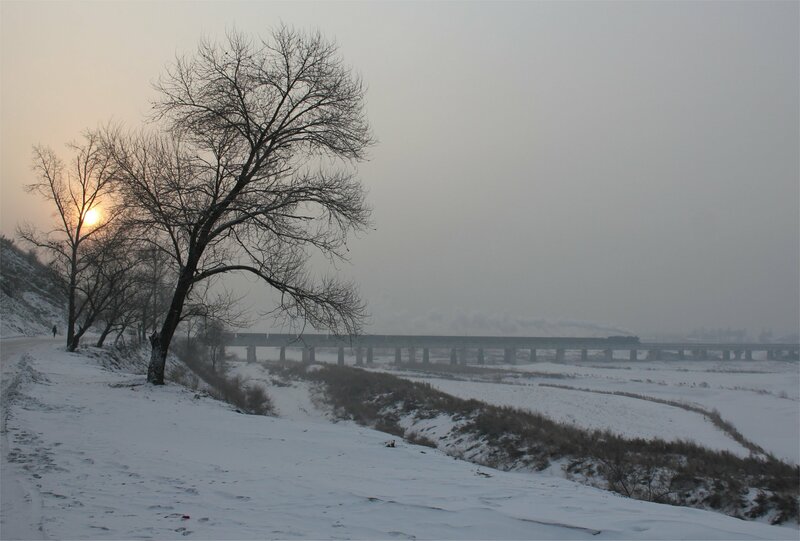 The hope was to capture the sight of a freight train crossing the river bridge between Chengzihe and Jixi Xi at sunrise. The slight flaw in the plan was the uncooperative forces of nature – instead of a warm glow we had grey skies with an almost imperceptible tint of pink… not quite what I hoped for! Unlike the first time I chose to forgo the tricky path down to the fields and settled for an atmospheric shot with a line of trees, icy road and luckily – sun. You can barely make out the steam in the distance, but I like the shot nevertheless… it captures a moment of pleasure, watching the freight train fill the length of the river bridge. The late morning and afternoon saw a visit to a couple more spots on the line, a stop at the local market and a return to the golden triangle to see the movements at the washery at Beicheng. It was, by all accounts, an unusually quiet day. The sight of an engineering train transporting spare rails gave rise to the suspicion that a broken rail somewhere had interrupted proceedings. An early start, a little after 6am, saw us catch the SY class steam locomotives working at first light – albeit fairly grey and misty with no sunrise to speak of. We started at the golden triangle – a place I had long heard of from conversations on previous trips and which had almost taken on mythic qualities in the retelling. 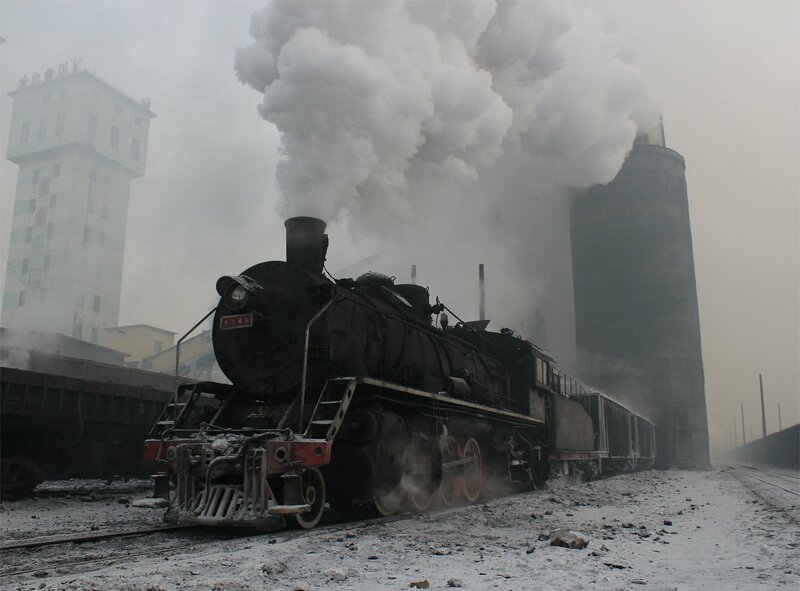 It didn’t fail to disappoint (after all, anywhere that can still produce 8 steam locomotives within an hour in the 21st century is remarkable) and was still relatively unblemished by the electrification poles that could be found in most other places in Jixi. We had to be very thankful for the early arrival of winter which prevented the erection of the remaining poles. 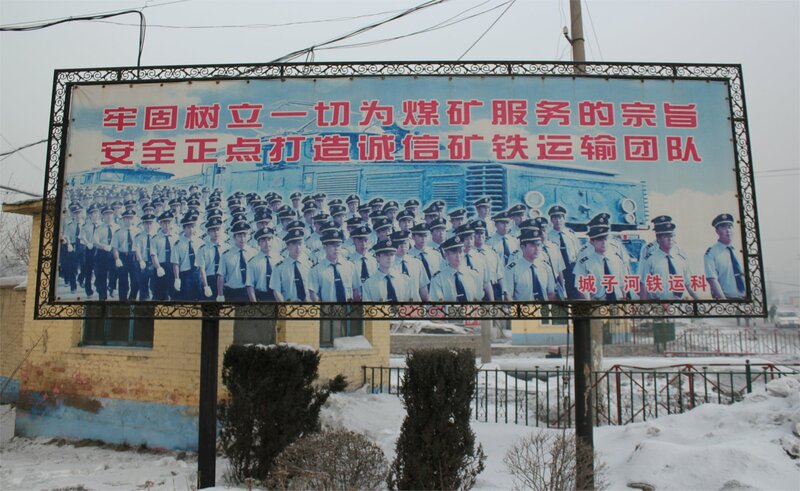 Our next stop was shift change at Dongsheng where you couldn’t help but notice the large advertisement for the future – one in which electric locomotives are king! Nevertheless, in spite of the poles here there was still plenty to see in every direction. It might be doomed, but for now it’s still another oasis of steam. At 5pm we headed out to a local restaurant for a delicious meal, but the visit gave rise to one of the more unusual sights I have seen in China – the outdoor deep freeze. 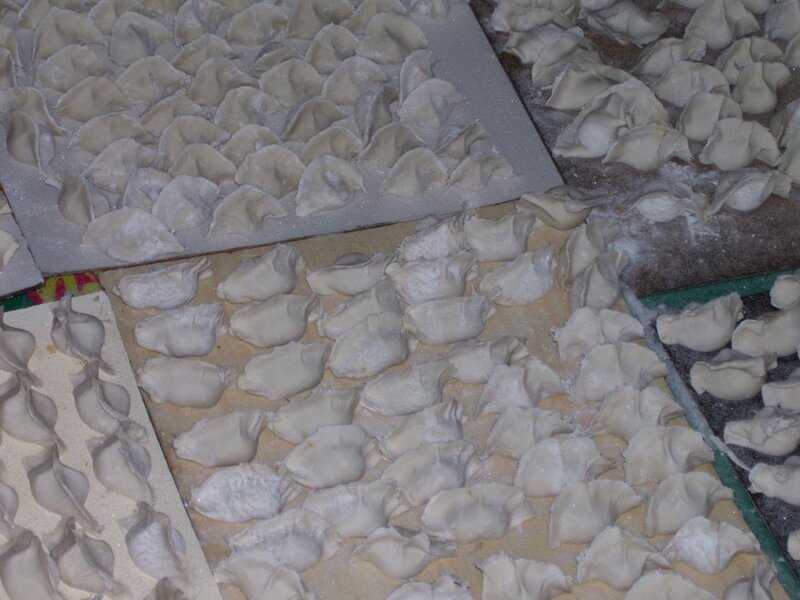 Inside the restaurant the family who ran the place were preparing batch after batch of dumplings and then taking them out to tables set up on the pavement to freeze. It was all very carefully organised with an awning set up to protect them from snowfall… quite incredible! The taxi took me and my luggage straight to a spoil dump (unusual I know) where I found the group leaping out of a minibus ready to photograph a SY class steam locomotive. I had arrived in the nick of time and with barely a moment to say my hellos I was standing trackside, camera in hand. The resulting shot will certainly never qualify as a masterpiece – but boy did it feel good after the last three days! It wasn’t long before the sun set (relatively early, around about 3.30pm I think) and shortly afterwards we saw a banked coal train and another working to the spoil dump. It may well have been a short day (for me) but I was so pleased to have ended the day on such a good note after the less than promising beginning! After arriving at Jixi I headed out of the bus and back into the cold. Now, all I had to was find the guide. In theory this should have been the easy bit, as the guide was supposed to be waiting for me with a sign. However, I had advance warning that he had forgotten this and the guide wouldn’t be able to tell me who he was as he didn’t speak any english. I had no doubt that the guide would spot me – after all, I was the only foreigner on the bus – but how would I know who he was amongst the usual scrum of taxi drivers?